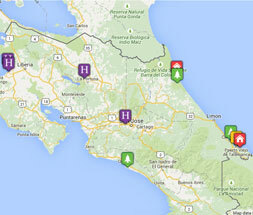 Tribes Overall: "Yes it lived up to expectations, Costa Rica is a very ecologically diverse country. It's fascinating and friendly!" Tribes Service: "Very helpful and flexible enough to deal with our vacillation over dates The holiday worked out very well, with all local transfers and flights etc being efficient and comfortable. " Guides: "All of a good standard, helpful and knowledgeable, the chocolate lady guide was very enthusiastic too!" Social & Environmental Responsibility: "Given that we are tourists, I think we and the tour were socially and environmentally responsible"
Enjoyable and comfortable, with a real rainforest feel. Helpful and enthusiastic guide and resort staff. The staff were very obliging and the wildlife was plentiful The food was undistinguished, but adequate, but the bungalow we stayed in was a long way from the main lodge, across a busy road, and was rather old-fashioned in feel. Nice hotel, with spacious room with a fine outlook Attractive "adult-only" pool and bar Main restaurant was expensive and disappointing, the more casual poolside restaurant was better. "Really loved Casa Corcovado and the Osa Peninsula, especially the sundowners overlooking the ocean!"